Hanif Abdurraqib is one of the most unique voices in modern journalism and poetry. His 2016 poetry collection The Crown Ain’t Worth Much was a standout last year, and his often calm delivery of poetry is hypnotic. 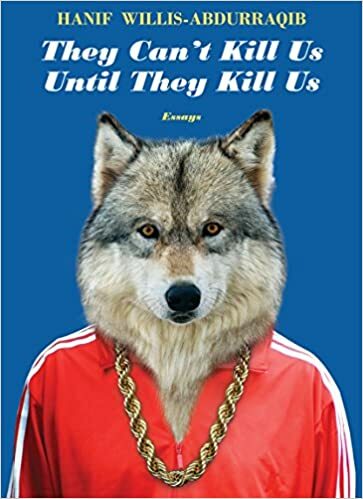 Like Crown, this essay collection They Can’t Kill Us Until They Kill Us is a beautiful meditation on pop culture, race, personal history, and the places where those conversations meet. Abdurraqib sculpts his prose in a conversationally engaging but also comforting tone. On a purely aesthetic level, the structure of They Can’t Kill Us is perfect. Each section is led with an excerpt narrating Marvin Gaye singing the national anthem at the 1983 NBA All-Star Game leading to his death. Music plays a large part in Abdurraqib’s life as it comes up constantly in all of his writing, and it’s the lens he uses throughout the first four sections of the book. The book begins relatively light-essays focusing on pop music like Carly Rae Jepsen, Bruce Springsteen, The Weeknd, etc. The second and third sections have a bit more weight- focusing a little bit more on race and a large concentration on death using a number of punk bands like Fall Out Boy, The Wonder Years, Cute Is What We Aim For, etc. The fourth is a much more explicit exploration of race through a lens of Kendrick Lamar, Allen Iverson, and Boyz in the Hood. This changes in the fifth section. Here Abdurraqib’s essays are much more deeply personal than before. He discusses his relationship to his Muslim faith, spending Thanksgiving with his partner’s white father, and getting pulled over by the police. The order for the essays is incredibly nuanced in itself as Abdurraqib knows where to place an emotional essay versus a more lighthearted essay. The final chapter builds on large emotions, but he closes the collection with an essay about children being children, even when time seems scary. It’s uplifting. He draws comparisons to Springsteen taking the stage to Moses arriving in Israel. He captures the joy of seeing people in love at a Carly Rae Jepsen show that makes you want to fall in love and go to see a popstar. His language and poetry share so much. Even his essay, “August 9, 2014” is basically a deletion poem. Abdurraqib describes music like no other, because he finds a way to tie it to his life and the larger world without seeming forced. The personal essays leave the most lingering emotion. In an essay highlighting the Paris terrorist attacks, he discusses his experience as a Muslim who loved punk and rap music, but his description of the people who frequent shows is the best: “Live music, even at its most unhealthy and potentially violent, has historically provided a small mercy for young people who found no mercy elsewhere.” Abdurraqib’s descriptions of his relationship to his race and religion are something that many white Americans (myself included) can’t fathom: “I mostly thought about how I perhaps owned nothing. Not even my own hands, pressed behind my back.” He writes in deep detail the emotions that he went through during the death of his mother. He also discusses his relationship to his Muslim upbringing following 9/11, and it should be required reading for any student studying the attacks. Abdurraqib’s anger and sadness upon hearing of the various African-Americans killed from police violence and racism will rattle the soul of any reader with empathy. Alongside these essays, Abdurraqib closes with a sense of hope. One of the final essays is titled “The Obama White House, A Brief Home for Rappers.” It’s a fond reminiscing on President Obama’s time in office, reflected in a photo of him with a number of rappers. In the essay “November 22, 2014,” there is sweetness in his description of his relationship to his partner’s father, even if the essay as a whole is about gun control. The closing essay is called “Surviving on Small Joys”; it’s the aforementioned essay about letting children be children and finding joy in that. There is an irony to this collection that has such an emotional heaviness ending with an essay about finding joy in the naivety of children. In writing about his experience, Abdurraqib doesn’t allow the reader to be naïve. He draws you in with the beautiful language then forces you to face a reality you may have been unaware of or know to well. Even if this can be an occasionally difficult book, it’s still a small joy.